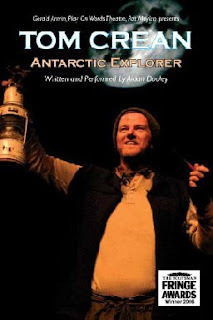 I got to see Aidan Dooley's last performance of Tom Crean - Antarctic Explorer in the current run at the Olympia last night. And what a performance: an extraordinary artist bringing to life an extraordinary story about an extraordinary man. The play touched me at many levels; first the story itself - enough to make any 'gentleman now-a-bed ... think themselves accurs'd they were not here, and hold their manhoods cheap whiles any speaks' of Crean, Shackleton and Scott. More powerful still, perhaps, was Aidan Dooley's ability to bring alive in our imaginations the men, the landscape and the endurance of these giants of the human spirit. There really is something primeval about this human capacity for story telling, and for story listening. Wonderful. Do go the next chance you get.